Bicycle riding can be a fabulous family activity, when done safely. While young children may ride with their parents or petal around in tricycles, between the ages of 3 and 4, most children are ready to try riding a two wheeler with training wheels and coaster brakes. Before you embrace bicycle riding as a family activity, be sure to consider these bicycle safety tips. Wear an appropriate helmet. When choosing a bicycle helmet for your child, be sure to opt for one that meets the standards set forth by the Consumer Product Safety Commission (CPSC). Such helmets will have a sticker stating it meets the CPSC standards. The helmet should fit snug, be warn level and the straps should be fastened snugly. Ride a proper fitting bike. When choosing a bicycle for your child, size is based on wheel diameter. Most 2-4 year olds start off in a 12 inch bicycle with training wheels. Around 5-8 years of age, they’ll grow into a 16 inch bike. Appropriate footwear is essential to protecting your child’s feet from injury when bike riding. Never allow your child to ride barefoot or wear flip flops or sandals. Instead, insist he wear sneakers that can help him best grip the pedals. Understand the rules of the road. These include riding with, never against, traffic, walking your bike across the street in the crosswalk, always checking both ways when leaving the driveway, riding single file, obeying traffic signs and lights and always passing other riders or walkers on the left. Use caution when riding with baby. Many parents look forward to taking their baby on their first bike ride. 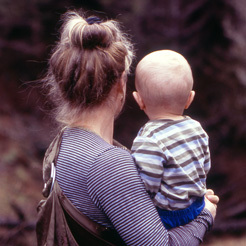 Consumer News recommends waiting until children are at least one year old before taking them on a bike ride in a trailer or bicycle mounted seat. Prior to purchasing a trailer or seat, test it out on your bike with weight in it, like a sack of potatoes, to see how your bike handles with the attachment. Children riding in seats or trailers should always wear helmets. 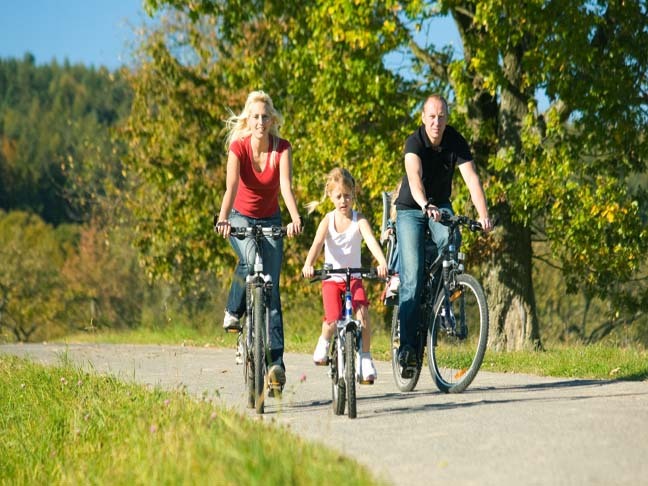 Bicycle riding is a great activity for the entire family. When taking proper safety precautions you can decrease the risk of injury and maximize the fun. What age did your child start participating in family bike rides? What safety rules do you follow? Share your thoughts in the comments below.